If you ask people what they want in a family room, most will tell you that they are looking for something well designed, elegant and inspiring, yet also livable, comfortable and fun. 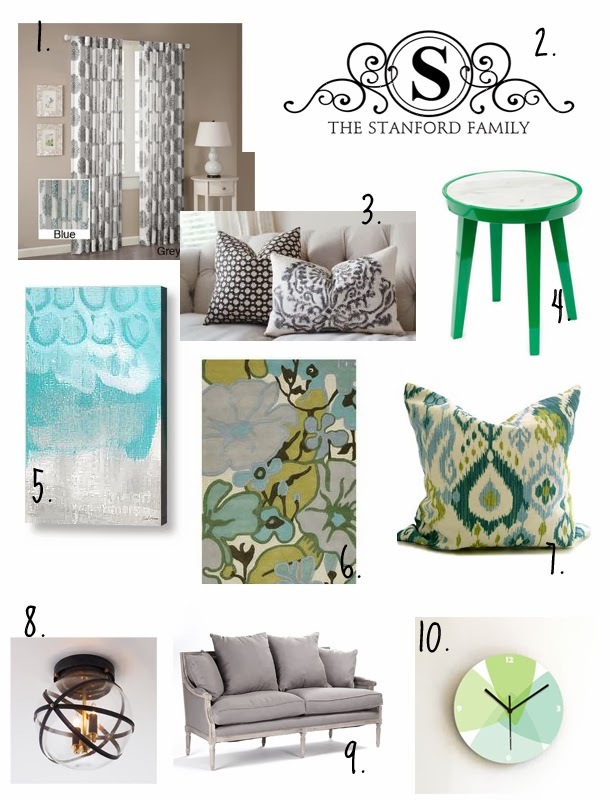 This room combines all of those qualities in a soothing gray, blue, and green color palette. 1. These simple yet refined window treatments pack a stylish punch in an updated arabesque pattern. 2. Choose your monogram, color and size to completely customize this Wall Quotes™ decal! Perfect over your entertainment center, sofa, or as part of a gallery wall. 3. This intricately embroidered pillow is a chic way to add some ethnic flair to your space! 4. Lacquered finishes are all the rage currently, and in a beautiful and bold kelly green, this gorgeous piece will add function and flair to your family room. 5. This mixed media canvas is a beautiful blend of turquoise, white and gray, and would be a conversation piece in any room. 6. Modern and bold, yet timeless, this Amy Butler rug was the very lovely starting off point for this space. 7. Is anything more stylish right now than Ikat? This pillow adds sophistication, color and fun to this family room. 8. This Shades of Light pendant is a striking and elegant addition to any room. The styling is on trend and classic all at the same time. 9. European styling meets rustic elegance in this sofa from Layla Grayce. Isn't she lovely? 10. To add a bit of much-needed fun and whimsy to this space, how about a retro-inspired, handmade clock? The pastel shades and simple styling are a winning combination.